SOUTHAVEN, Miss. – The Mississippi RiverKings of the Southern Professional Hockey League (SPHL) announced Tuesday that they signed forward C.J Hayes to a standard player contract. Hayes, who hails from Margate, Florida played in 55 games for the Lakers, tallying 4 goals, 4 assists for 8 points, but he has only skated in three games for the Lakers this season as the forward ranks were bolstered in the recent offseason. As of this posting, no official word from the school has been released. 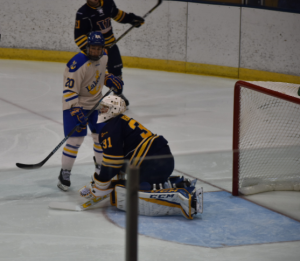 This is the second mid-semester signing of a player in two seasons, with the previous being defenseman Owen Headrick, who left the team a few weeks after the Christmas break to play with the Erie Otters in the OHL. The 2017-18 team has now seen two early player departures, as netminder Cooper Lukenda left the team in early November to play junior hockey with the Kemptville 73’s of the Central Canada Hockey League (CCHL). We will update this post if more details come out from this departure. We wish C.J. nothing but the best as he takes his first steps into professional hockey.